If you are a fan of asparagus and are interested in growing it in your Southern California garden, pick a spot, prepare the soil and get ready to buy asparagus crowns as soon as they are locally available in early spring. It will be a couple of years before you get any sort of decent harvest and even longer before your crop really begins to flourish. This means that you should start to grow asparagus now so that you can enjoy it as soon as possible. Of course, this also means that you will need a good bit of patience to get you through the next couple of years while you will be tending to your garden bed without harvesting spears as you allow plants to become established. Since there is no time to waste in getting your asparagus patch going, let’s jump right into how to grow asparagus in Southern California. 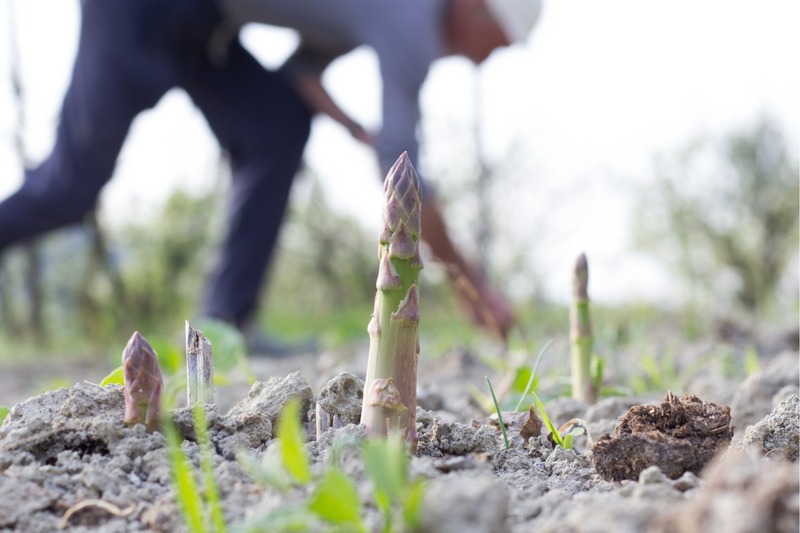 Once established, you can expect your asparagus plants to provide spring and fall harvests for about 20 years. Because they are going to stick around much longer than most of the food plants in your garden, choosing the spot where you want them to be for the next two decades is even more important. The first thing you should consider when choosing a spot is that your asparagus should get at least six hours of sun each day, and it would be even better if it can get eight hours. Therefore, you will want to be sure to pick a sunny spot in your garden or yard. Because of the fern-like appearance of asparagus plants, you could use them as part of an edible landscape design or intermixed with ornamental plants in flowerbeds. Another important consideration when picking a spot is that the leaves of asparagus plants are toxic to dogs. Therefore, if you have a dog that tends to get in the garden or eat your plants, you will want to be sure to plant your asparagus away from areas frequented by your pets. Remember — this garden bed is going to be in use by the same plants for 20+ years, so it is well worth it to make the effort to really prepare the soil well for your future asparagus harvests. While you can plant asparagus in the ground, it is going to be a better idea to plant it in raised garden beds in most parts of Southern California. Installing raised garden beds allows you to have much better control over the soil and to more easily build the slightly acidic, well-draining, nutrient-rich soil in which asparagus thrives. You can achieve this by mixing compost and peat moss into garden soil. If you choose to plant your asparagus in the ground, plan on turning over about one foot of soil in your garden bed. If you are working with clay soil, you will want to mix in some compost to improve the drainage. If you are planting in the ground with sandy soil, mix in some compost and peat moss. You will also want to make sure the area is free of weeds before planting. Asparagus plants can be started from seed, but this is going to add up to two years to your waiting time before your first harvest, so, unless you are just really patient and committed to starting your plants from seeds, start from one- or two-year-old crowns. You can purchase asparagus crowns at your local nursery in spring and will want to plant them right away after acquiring them. Be sure to ask for an all-male cultivar to ensure a more bountiful harvest. 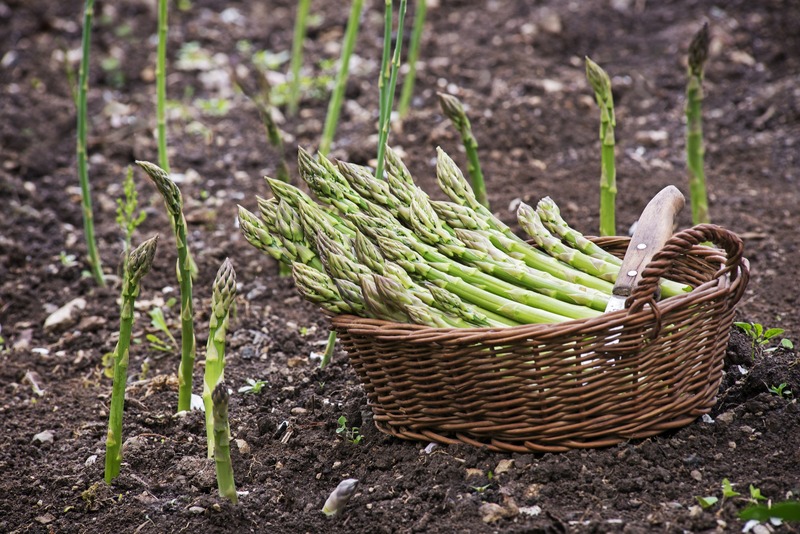 To plant asparagus, dig a trench or small holes that are about six inches deep and 12 inches apart. Spread the roots as you set your crowns (crown facing up) in each of the holes. Cover the bottom three inches of each crown with soil, making sure that the top of the crown is not covered in dirt. As your plants grow, continue adding small amounts of soil until the original hole is filled and your asparagus is growing above ground level. 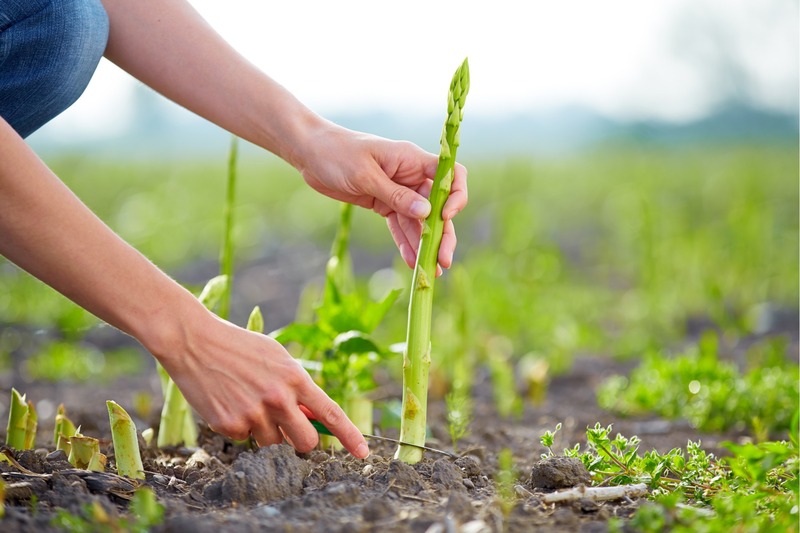 For the first one to two years, you should not harvest any asparagus, because you must first allow the plants to develop root systems and become well established. 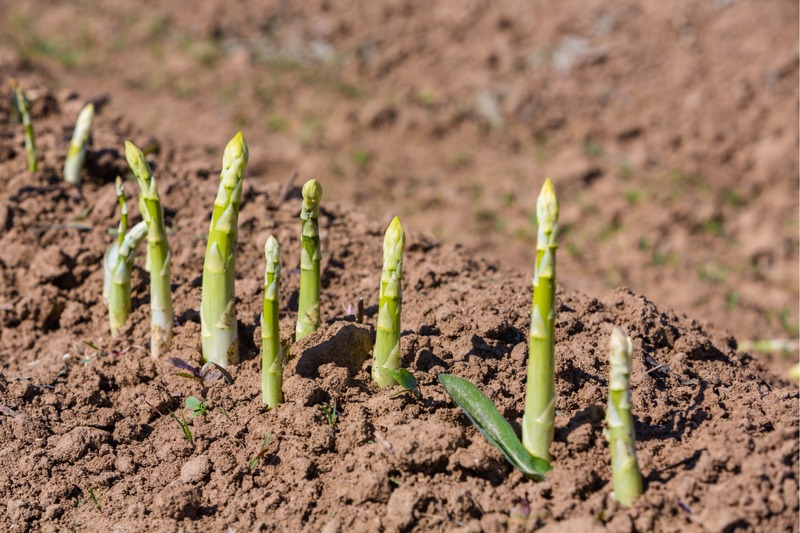 After all, these plants are going to be producing delicious asparagus spears for up to about 20 years, so it is certainly worth the wait to allow them to become established. Until it is time to begin harvesting your asparagus (ideally in the third growing season), you will need to regularly water your asparagus bed and keep a thick layer of mulch around the plants to inhibit weed growth. Once your asparagus is established, it will crowd out most weeds, but until then it needs a little help so that it does not have to compete with weeds for water and nutrients. Side dress your asparagus plants with compost in spring and fall. You can also apply a small amount of organic fertilizer. In fall, remove any dead foliage. 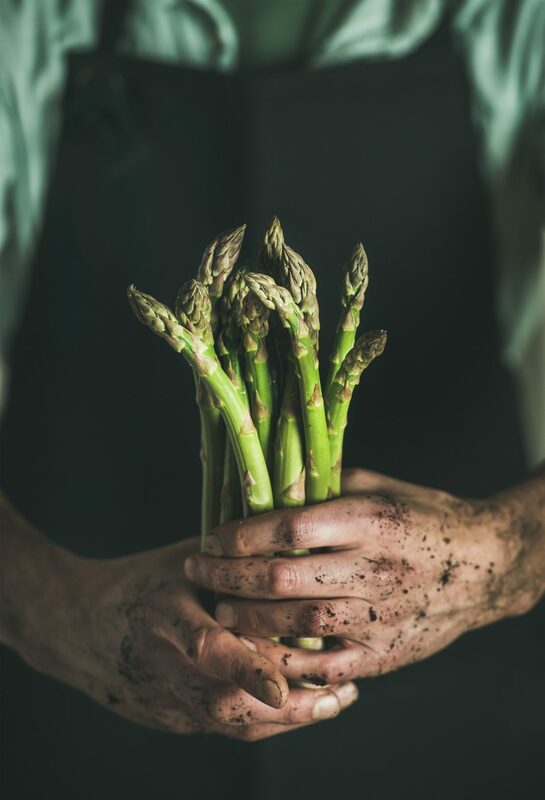 One of the most important things you need to remember about harvesting asparagus is that you must leave some spears so that they can mature, develop their fern-like foliage, and continue to nourish and strengthen the plant in preparation for the next growing season. If you begin to harvest your asparagus in the second year, take only a small amount and be sure to only cut spears once they have reached about five inches in height and about one-quarter inch in diameter. Also, you should only harvest spears for two to three weeks, and then leave remaining spears alone to mature and strengthen the plant. One you have reached the third growing season, you will be able to harvest more asparagus and for longer periods of time. Look for spears that are between five inches and seven inches in length and more than one-quarter inch in diameter. During this third growing season, you will likely be able to harvest spears for up to about five weeks before leaving the rest to allow the ferns to grow. If your plants are well established and producing well by the fourth season, you can harvest spears for about two months. To harvest spears, you can simply snap them off at ground level, or you can use a knife or garden shears to cut them. Asparagus can be kept at room temperature if it will be eaten within a few hours of harvesting. It can be frozen or kept in the refrigerator for longer storage. To store asparagus in the refrigerator for up to one week, stand the spears up in one inch of water in a jar, bowl or glass. Cover the asparagus loosely with a produce bag or other plastic bag. 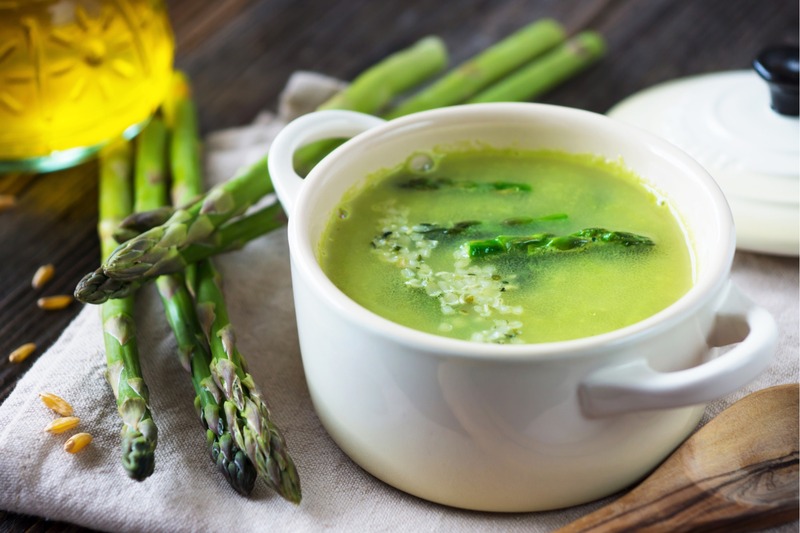 To store asparagus in the freezer, you must first blanch it, then place it in a bowl of ice water to stop the cooking process before draining it and placing it in plastic bags.